A Northumberland man who completed a gruelling 64-mile cycle journey just six months after undergoing a knee replacement has urged those suffering from knee pain not to put off having surgery. Research from Nuffield Health has shown that more than 70 per cent of patients put off having surgery for at least one year, with the top reason being that it makes them ‘feel old’. Ian Blacklock pictured during the Virgin Money Cyclone Challenge. For Ian Blacklock this certainly was not the case, as he embarked on a vigorous training programme for a notoriously hard bike ride. He was determined to complete the Virgin Money Cyclone Challenge – a cycle ride through the Northumberland countryside that allows non-competitive cyclists to test their fitness. The route, which starts and finishes at Newcastle Falcons Rugby Club, includes a number of steep hills, with a total ascent of 3,993ft. Just six months before undertaking the challenge, the 60-year-old underwent replacement knee surgery at Nuffield Health Newcastle Hospital after a recurrence of an old rugby injury. The surgery was carried out by orthopaedic surgeon Professor David Deehan. 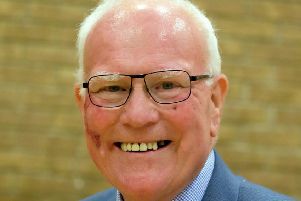 Mr Blacklock, who lives in Nedderton Village near Bedlington, said: “I was in considerable discomfort before the operation and it was even affecting my job, where I’m on my feet for long periods each day. “I was able to cycle for a limited amount of time, but couldn’t do steep hills and my knee would ache for a couple of days afterwards. “I was delighted with my recovery after the operation and I’m now cycling better, and feel younger and fitter, than I had in the 15 years before the op. The Virgin Money Cyclone Challenge was brilliant as it gave me something to work towards during my recovery. “I urge people not to put off surgery and worry about it making you feel old – the sooner you have it done, the sooner your recovery can begin.